the first element discovered by spectroscope. they obtained seventeen grams of caesium oxide. got pure caesium from electrolysis of caesium cyanide. Caesium formate for drilling fluids. Caesium atom transitions in atomic clocks. and to emit light in magnetometers. Caesium iodide and bromide in radiation detectors. Caesium nitrate in infrared flares. we would live, it seemed, forever. 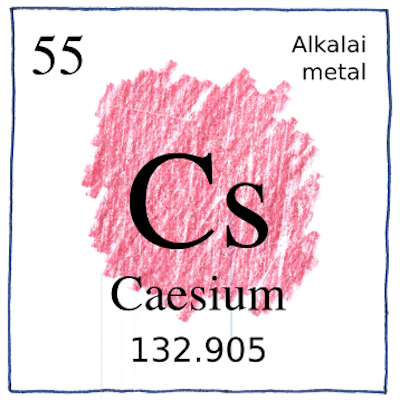 Common isotopes of caesium are neither radioactive nor particularly toxic; however, the metal explodes violently on contact with water, even exposed to air with the slightest humidity.